I’ve been thinking about my maternal grandfather today. I remember how he used to watch the sunset each night, tracking how it moved as the season changed. He’d sit at the kitchen table and look out the window of the little farmhouse he’d built decades before, as the sun went down behind the “mountain” on his farm. He would point out which fence post was closest to the sunset, then tell me how far the sunset moved from winter to summer. He watched the weather carefully, had pails to catch the rain as it fell off the roof, and milked the cows morning and night. A farmer is connected to the sun, seasons, weather and land in a way that’s difficult for non-farmers to understand. His livelihood is directly linked to what happens on his land. I wish everyone would realize how much we all depend on the Earth, our home, for our survival. I want to be sure that my son grows up connected to the land. While I love biology and have studied living things formally and informally for almost half of my life, my knowledge of the non-living aspects of our planet is not where I’d like it to be. I can rattle off facts like the percentage of nitrogen in the atmosphere or the sand/silt/clay proportion of loam, but I can’t tell you where the sun set in relation to the “mountain” outside my window tonight. I want to work on being more connected to the cycles of nature, and share it with my family. And so I began today with allowing my son Joshua to crawl around in the grass, discover and play until his heart’s content. He felt the warm sun on his back, picked up leaves and pieces of cornstalks and rocks and pulled up weeds. I didn’t tell him no, didn’t redirect him or rush to take away the treasures he picked up. Exploring, learning and living in the moment. This article has been edited from a version previously published at Farmer’s Daughter. What a lovely article! I’ve been thinking along the same lines. Just yesterday, I was feeling glad to have my boys outside for an extended time with nothing in particular to do. Kids love to be outside. Who doesn’t, as a matter of fact? When my sister’s child was about 2, he came to visit us. We live in the suburbs and have a backyard. My sister lives in NYC. Her boy would crawl around only on his hands and knees–he wouldn’t even let his legs and feet drag in the grass. 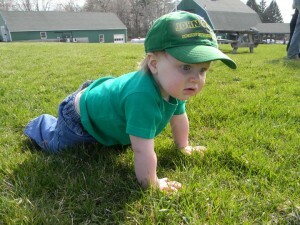 He kept his toes pointed up toward the sky while he crawled because he didn’t like the feeling of the grass! It’s great to get them outside as early as possible. 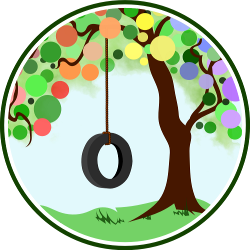 You are doing a wonderful job helping your son connect to the environment, letting him explore in a natural way. You’re an incredible educator, environmentalist, and Mommy; thanks for sharing!! !